The Romans established a form of government — a republic — that was copied by countries for centuries In fact, the government of the United States is based partly on Rome's model. The ladder to political power in the Roman Senate was different for the wealthy patricians than for the lower-class plebeians. Once free, the Romans established a republic, a government in which citizens elected representatives to rule on their behalf. A republic is quite different from a democracy, in which every citizen is expected to play an active role in governing the state. The Roman concept of the citizen evolved during the Roman Republic and changed significantly during the later Roman Empire. After the Romans freed themselves from the Etruscans, they established a republic, and all males over 15 who were descended from the original tribes of Rome became citizens. Citizens of Rome distinguished themselves from slaves and other noncitizens by wearing a toga; most wore a white toga. During the Empire, each emperor wore a purple toga to distinguish himself as the princeps, or "first citizen." Citizenship varied greatly. The full citizen could vote, marry freeborn persons, and practice commerce. 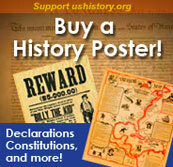 Some citizens were not allowed to vote or hold public office, but maintained the other rights. A third type of citizen could vote and practive commerce, but could not hold office or marry freeborn women. In the late Republic, male slaves who were granted their freedom could become full citizens. Around 90 B.C.E., non-Roman allies of the Republic gained the rights of citizenship, and by 212 C.E, under the Edict of Caracalla, all free people of the Roman Empire could become citizens. Frescoes line the walls of long-forgotten Etruscan tombs. 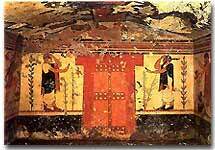 This painting, found in the Tomb of Augurs in Tarquinia, is titled Hell's Door. The aristocracy (wealthy class) dominated the early Roman Republic. In Roman society, the aristocrats were known as patricians. The highest positions in the government were held by two consuls, or leaders, who ruled the Roman Republic. A senate composed of patricians elected these consuls. At this time, lower-class citizens, or plebeians, had virtually no say in the government. Both men and women were citizens in the Roman Republic, but only men could vote. Tradition dictated that patricians and plebeians should be strictly separated; marriage between the two classes was even prohibited. Over time, the plebeians elected their own representatives, called tribunes, who gained the power to veto measures passed by the senate. Gradually, the plebeians obtained even more power and eventually could hold the position of consul. Despite these changes, though, the patricians were still able to use their wealth to buy control and influence over elected leaders. Hannibal marched his elephants south into the Italian peninsula during the Second Punic War. 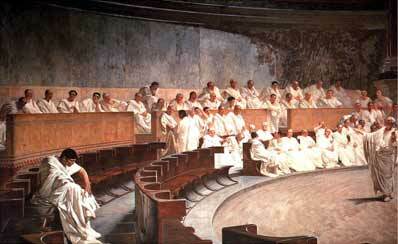 The history of the Roman Senate goes as far back as the history of Rome itself. It was first created as a 100-member advisory group for the Roman kings. Later kings expanded the group to 300 members. When the kings were expelled from Rome and the Republic was formed, the Senate became the most powerful governing body. Instead of advising the head of state, it elected the chief executives, called consuls. Senators were, for centuries, strictly from the patrician class. They practiced the skills of rhetoric and oratory to persuade other members of the ruling body. The Senate convened and passed laws in the curia, a large building on the grounds of the Roman Forum. Much later, Julius Caesar built a larger curia for an expanded Senate. By the 3rd century B.C.E., Rome had conquered vast territories, and the powerful senators sent armies, negotiated terms of treaties, and had total control over the financial matters of the Republic. Senatorial control was eventually challenged by Dictator Sulla around 82 B.C.E. Sulla had hundreds of senators murdered, increased the Senate's membership to 600, and installed many nonpatricians as senators. Julius Caesar raised the number to 900 (it was reduced after his assassination). After the creation of the Roman Empire in 27 B.C.E., the Senate became weakened under strong emperors who often forcefully coerced this ruling body. Although it survived until the fall of Rome, the Roman Senate had become merely a ceremonial body of wealthy, intelligent men with no power to rule. Occasionally, an emergency situation (such as a war) arose that required the decisive leadership of one individual. Under these circumstances, the Senate and the consuls could appoint a temporary dictator to rule for a limited time until the crisis was resolved. The position of dictator was very undemocratic in nature. Indeed, a dictator had all the power, made decisions without any approval, and had full control over the military. The best example of an ideal dictator was a Roman citizen named Cincinnatus. During a severe military emergency, the Roman Senate called Cincinnatus from his farm to serve as dictator and to lead the Roman army. When Cincinnatus stepped down from the dictatorship and returned to his farm only 15 days after he successfully defeated Rome's enemies, the republican leaders resumed control over Rome. One of the innovations of the Roman Republic was the notion of equality under the law. In 449 B.C.E., government leaders carved some of Rome's most important laws into 12 great tablets. The Twelve Tables, as they came to be known, were the first Roman laws put in writing. Although the laws were rather harsh by today's standards, they did guarantee every citizen equal treatment under the law. Females shall remain in guardianship even when they have attained their majority (except Vestal Virgins). A spendthrift is forbidden to exercise administration over his own goods. It is permitted to gather fruit falling down on another man's farm. If any person has sung or composed against another person a song such as was causing slander or insult to another, he shall be clubbed to death. Quickly kill ... a dreadfully deformed child. With respect to the law and citizenship, the Romans took a unique approach to the lands that they conquered. Rather than rule those people as conquered subjects, the Romans invited them to become citizens. These people then became a part of Rome, rather than enemies fighting against it. Naturally, these new citizens received the same legal rights as everyone else. The early Roman Republic often found itself in a state of constant warfare with its surrounding neighbors. In one instance, when the Romans were fighting the Carthaginians, Rome was nearly conquered. The people of Carthage (a city in what is today Tunisia in north Africa) were a successful trading civilization whose interests began to conflict with those of the Romans. The two sides fought three bloody wars, known as the Punic Wars (264-146 B.C.E. ), over the control of trade in the western Mediterranean Sea. 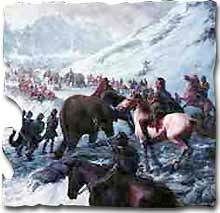 In the second war, Hannibal, a Carthaginian general, successfully invaded Italy by leading an army — complete with elephants — across the Alps. He handed the Roman army a crushing defeat but was unable to sack the city of Rome itself. After occupying and ravaging Italy for more than a decade, Hannibal was finally defeated by the Roman general Scipio at the Battle of Zama in 202 B.C.E. How did the word "Punic" become an adjective meaning "relating to the people of Carthage"? "Punic" is derived from the Latin word Poenicus, meaning "an inhabitant of Carthage." Carthage was founded by Phoenicians, and Poenicus is the Latin word for "Phoenician." By the Third Punic War, Rome was ready to end the Carthaginian threat for good. After a successful several-year siege of Carthage, the Romans burned the city to the ground. Legend has it that the Romans then poured salt into the soil so that nothing would ever grow there again. Carthage was finally defeated, and the Roman Republic was safe. Want to know more about the most influential empire the Western world has ever seen? The Roman Empire website covers every aspect of Rome from the founding of the city in 753 B.C.E. to the fall of the western Roman Empire in 476 C.E. Click on the buttons on the main page for general topics, such as religion and society. Fantastic interactive maps show the growth and decline of the Roman Republic and Empire. Use the menus at the bottom of the page for more specific searches about Roman life. In its time, the Roman Republic was a revolutionary approach to government. Find out about this early democracy and the difficulties it faced. Ancient History Sourcebook: The Twelve Tables, c. 450 B.C.E. In 450 B.C.E., the Law of the Twelve Tables was created to meet the need for a reliable set of Roman laws. The citizens of Rome were pleased because the Twelve Tables gave them a written copy of the rights they thought they deserved. After the Twelve Tables were written, the plebeians — who were originally little more than slaves — were finally allowed entrance into the Senate and the priesthood. This helped prevent a civil war between social classes. For all its size and might, the Roman Republic truly feared the north African general Hannibal. He marched through the Roman countryside virtually unopposed for 16 years until his defeat at the Battle of Zama in 202 B.C.E. ended the Second Punic War. After it destroyed Hannibal's city, Carthage, the Roman Republic became an international power that later grew into a giant empire. Even hundreds of years after the fall of the Roman Empire, the Roman army and navy served as the examples for all other military units to follow. Check out the tactics, formations, and inventions that made the Romans the crew to beat. According to the Etruscan religion, any person who lived beyond the age of 84 was too old to understand the "signs of the gods." Likewise, this archaic, Greek-based culture saw its own downfall in the belief that the culture's existence was limited by the gods. Predating the founding of Rome, the Etruscan civilization was the first to inhabit the Italian peninsula. Here, learn about their pottery and gold work, music and fashion, history, and much more. Although not many details are known about the Etruscan people, they left behind a wealth of art and architecture that remains over 2,500 years after the Romans overthrew the oligarchy of Etruscan rulers. Take a tour of Etruria, or visit the online museum for examples of the Etruscan way of life, long overshadowed by the Roman civilization. So you want to become a citizen of the Roman Empire? No problem at all, as long as you fight in at least six months of battles or two major wars!